This October, challenge the ultimate curse at the fifth edition of *SCAPE’s Museum of Horrors! Unearthed from the deep sands in the Middle East is a relic so mysterious, it is believed to belong to a long-lost city as enigmatic as the Atlantis. Estimated to be over 2,000 years old, little is known about the idol-like ornament, the race it belonged to, and why the race was eradicated so suddenly that virtually no records of its existence exists today. Since its discovery, the Relic has been making its rounds in the academic circles, where baffled archaeologists, researchers and scientists struggled immensely with whether it held any cultural or mystical significance during its time. The Relic will journey to Asia for the first time, coming to Singapore to be studied by local scientists and anthropologists. 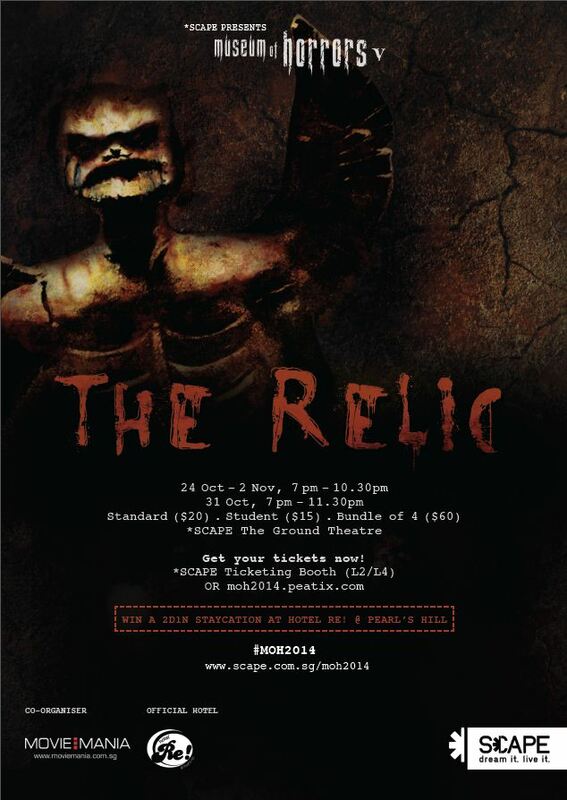 The Relic will also make its public debut at the Museum of Horrors exhibition, held exclusively from 24 October to 2 November 2014 at *SCAPE, The Ground Theatre. The exhibition is open to all, and amateur researchers and investigators can finally get up close and personal with the Relic. However, unbeknownst to most, the Relic is rumoured to be far more treacherous than the famed King Tut mummy and the fabled Hope Diamond. There are whispers that the Relic possesses an evil curse so powerful; that whoever as much dares to cast a glance directly at its eyes will encounter imminent misfortune. Of course, no one knows for sure, but everyone who seemed to have had close contact with it (from the excavation diggers to the carbon dating experts) was met with strange, untimely demise. Coincidence or not, we won’t venture to say. Come to the Museum of Horrors V: The Relic and decide for yourself ! Manoeuvre your way through a horror maze with 5 realistic dioramic sets, and be prepared to meet your worst nightmare ! AND stand a chance to win a 2D1N staycation at Hotel Re! @ Pearl’s Hill, worth up to $700!